Paz military earth observation satellite is built by Airbus Defence and Space. Image: courtesy of Airbus Defence and Space. The Spanish Paz satellite is owned by Hisdesat. Image: courtesy of Airbus Defence and Space. The Paz satellite is scheduled for launch in 2015. Image: courtesy of Airbus Defence and Space. The earth observation satellite will operate at an altitude of 514km. Image: courtesy of Airbus Defence and Space. Paz satellite has a height of 5m. Image: courtesy of Airbus Defence and Space. The Paz satellite is equipped with X-band SAR. Image: courtesy of Airbus Defence and Space. Paz is a new military earth radar observation satellite, designed and built by Airbus Defence and Space to meet security and defence requirements of the Spanish Government. The satellite is owned and operated by Hisdesat. The Paz satellite is intended to perform global observation to assist multiple military and civil applications including rescue, maritime surveillance, tactical support, border control, natural disaster management, environmental control, risk management, and counter-piracy actions. Paz was earlier known as the Satélite Español de Observación SAR (SEOSAR) observation satellite. Its production and integration process was completed in Madrid in September 2013, while the launch is scheduled for the first quarter of 2015. The satellite will be placed in sun-synchronous dawn-dusk orbit at an altitude of 514km, and will operate with a velocity of 25,200kmph. It can provide images under all-weather conditions during day and night. "The Paz satellite is intended to perform global observation to assist multiple military and civil applications including rescue, maritime surveillance, tactical support, border control, natural disaster management, environmental control, risk management, and counter-piracy actions." Paz is the first earth radar observation satellite in Spain, and is part of the Spanish National Earth Observation Programme (PNOTS), which is owned by the Spanish Ministry of Defence and the Ministry of Industry, Trade and Tourism. Hisdesat, a government satellite services operator, signed a contract with Airbus Defence and Space for the development and construction of Paz in November 2008. The total cost of the satellite’s design, development, flight and ground segments, and launch is estimated to be €160m ($180m) of which, €135m ($152m) will be funded by the Spanish Ministry of Defence and the remaining by Hisdesat. As the prime contractor, Airbus Defence and Space is responsible for the development, construction, systems engineering, integration, testing, validation, and locating the satellite into orbit. The synthetic aperture radar (SAR) sensor was designed and built by Airbus Defence and Space at its Madrid-Barajas site. The Paz programme also involved participation by 18 Spanish companies. GMV was contracted in October 2011 to provide a mission control centre for the Paz satellite. Russian firm ISC Kosmotras was chosen by Hisdesat for the launch of the Paz satellite on its Dnepr launcher. Paz earth radar observation satellite performs efficient monitoring of surface-based activities, and can perform high-resolution mapping of a large geographical area. It can store up to 256GB of images and supply more than 100 images a day. Its normal revisit period is 11 days, and on-orbit mission duration is five and a half years. The satellite is 5m high and has a diameter of 2.4m, and weighs 1,400kg. The solar array fitted to the satellite generates an output power of 850W, and the maximum coverage area of the satellite is more than 300,000km² a day. 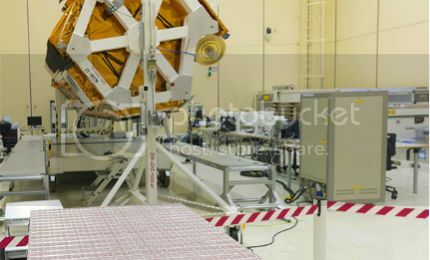 The satellite is primarily equipped with an X-band SAR instrument incorporating printed-radiator planar phased-array radar antenna, which is 4.8m long and 0.7m wide. It operates in multiple modes such as Spotlight, ScanSAR, and Stripmap to produce SAR images with variable swath width (5km-100km) and resolution (1m-15m). Paz can transmit imagery data to the ground control station at a rate of 300Mbits per second in X-band. It will also carry the Radio Occultation and Heavy Precipitation (ROHP) experiment payload and an exactEarth Automatic Ship Identification System (AIS) payload. GÖKTÜRK-2 is Turkey’s first high-resolution remote sensing earth observation satellite, launched in December 2012. The ground segment, developed by the Spanish National Institute for Aerospace Technology (INTA), is a combination of two control stations sited at Torrejón near Madrid and Maspalomas, Gran Canaria. Data stored onboard is transmitted to the ground station, with the use of a downlink. The Dnepr launch vehicle, derived from the SS-18 liquid-fuelled ICBM, has a total launch mass of 210t. It uses a total of three stages and a space head module (SHM) to carry customers’ payload. It is equipped with UDMH and N2O4 propellants, and can lift payloads to a sun-synchronous orbit at an inclination of 98°. The launch vehicle has a flight reliability of 97%.